That's great shooting Jack H.! I've got some targets to show later. On my first target ever was a hardball score of 6 points. My first time holding a gun and the first time I shot was a hardball gun with military issued 230 gr jacketed ball ammo. 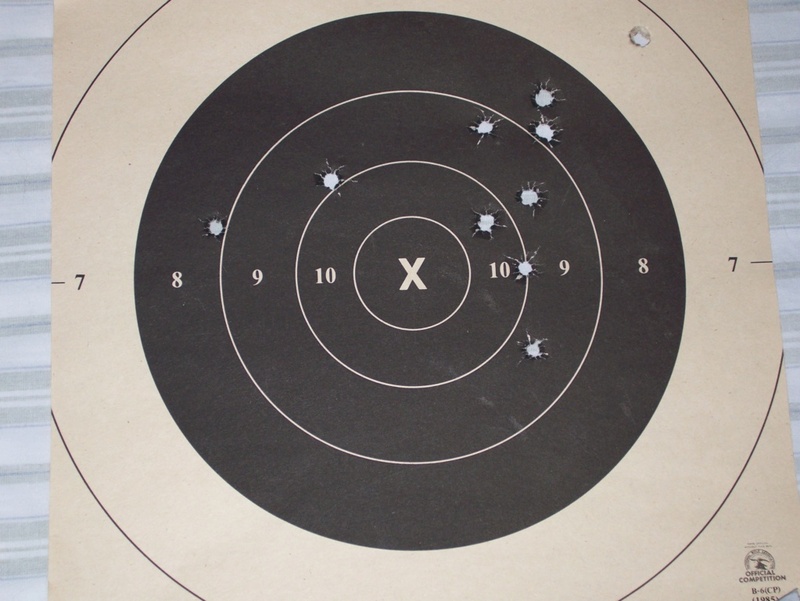 After a brief introduction to shooting by the Navy Chief range master, we proceeded with 10 rounds on 3 targets. 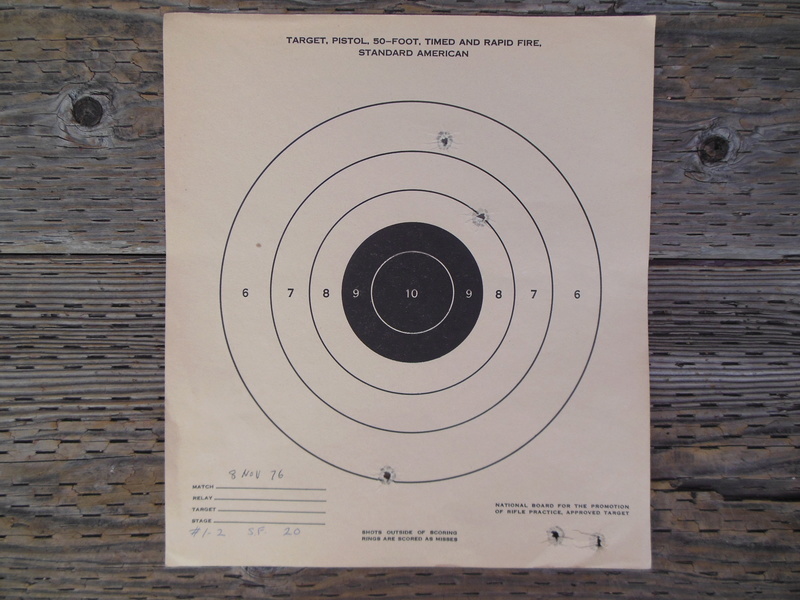 !st target: I didn't see too many shots on the white so I assumed they were all in the black. Wrong! 6 points total. 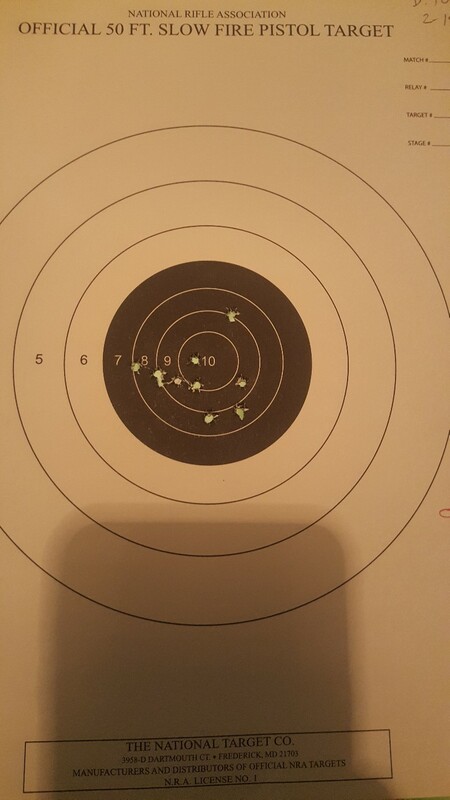 Note the sight picture the instructor drew on my target afterwards. "This is what you need to do doc!" 3rd target: I thought I was getting the hang of this, scoring 30 points. Recoil was not that bad after all. I kept these targets as a souvenirs just in case I never shoot again. But being an eye doctor and an officer I was treated like royalty and was given access to the range with all the ammo I needed. Probably shot 100 rounds of ball during my lunch hour, 5 times a week for about 5-6 months. 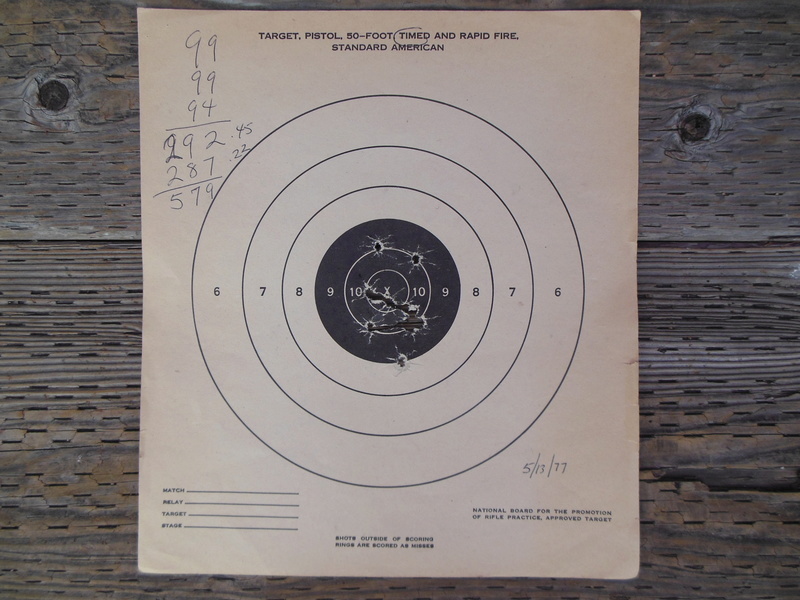 4th target: 2 months later, shooting in the high 90's during matches for the RTC (recruit training center) pistol team. 5th target: I think this was one of my last targets before being discharged from the Navy in 1977. Did not shoot at all until 2003. I recently measured the recoil spring weight from the pistol I'd used in the Navy. It was surprisingly only 12 pounds. We shot with what we had and no questions asked. Did not shoot a ball gun until 2004 Camp Perry when I placed in the President's 100 Match. Pistol arrived a week before flying to Ohio. Sighted the pistol in during the small arms firing class. LenV wrote: I shot this today as an experiment. Fired at 25yd not really SF and not really Timed. Sort of a take your time timed fire. It was raining hard enough I wasn't going to spend all day there. I wanted to test a different mounting style on the 52 and all I had to plop on it real quick was a cheepo Millett 30mm. Sort of makes me re-think the cheepo part. The 52 started throwing shots off call on the last match (had to switch guns) and I didn't know if it was the base or the Holosun. I think this eliminated the base as the problem. To be fair I will mount the Holosun on a different pistol sometime and see if it holds zero. Wow! Excellent shooting Len. If I may ask, can you share the details for the mount for your M52 scope? Also, those grips are nice! I have a boxed 52 from the 1990's but shoot .45 for centerfire (with iron sights and powder puff loads). I really like the configuration you show. Always willing to share with someone that throws a compliment my way. The base is from BME and they have three cross slot. The ring is half of a very strong set with 6 allen screws ( Burris XTR). The grips are Nills. I just threw it together that morning to test the BME base but will keep it like that for awhile. Pistol ran perfectly with that weight on the slide. Thanks! I've been considering selling my near mint M52. But, after looking at your setup I probably won't - that's pretty neat. I noticed the WST powder. 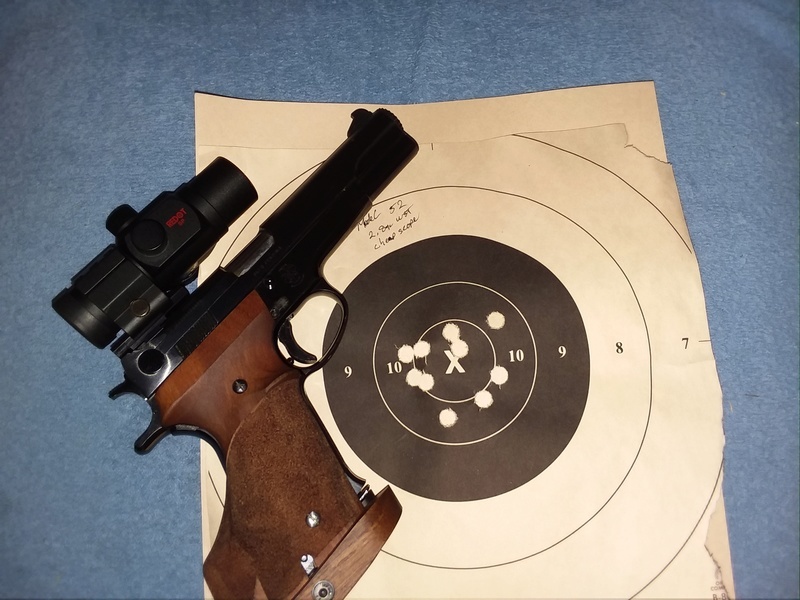 When I was reloading 148gr HBWC 38's I used red dot, but it seems many use WST. I'll have to try some. What I appreciated about loading the HBWC 38's was the AOL was based on brass length, which made reloading easy. Although, 38 special brass isn't as common as it once was. My apologies to the thread for this distraction. BME also makes one that goes all the way over the ejection port.. I have one on my wife's 52 with a 1" UD. Works very well. jglenn21 wrote: BME also makes one that goes all the way over the ejection port.. I have one on my wife's 52 with a 1" UD. Works very well. Please provide a web link to, "BME." Well....you paid for all the rings. If your timing was a little better you could have lost those two low shots. Ten rounds each. Ten feet away, but only a seven-inch target. The Benjamin weighs three pounds, has a seven-pound trigger weight, and has an inch of trigger creep. It's like training with weights. 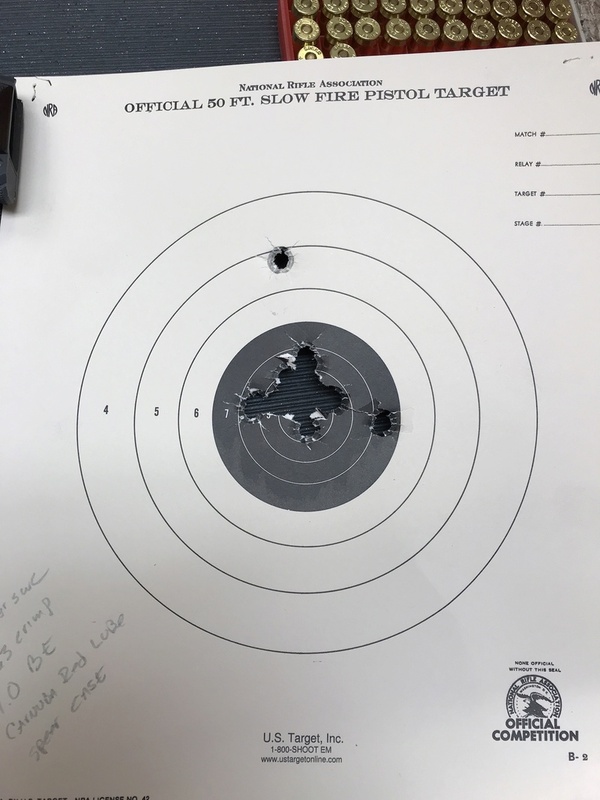 Shot this at our monthly NRA Indoor 1800 with a SA Range Officer. 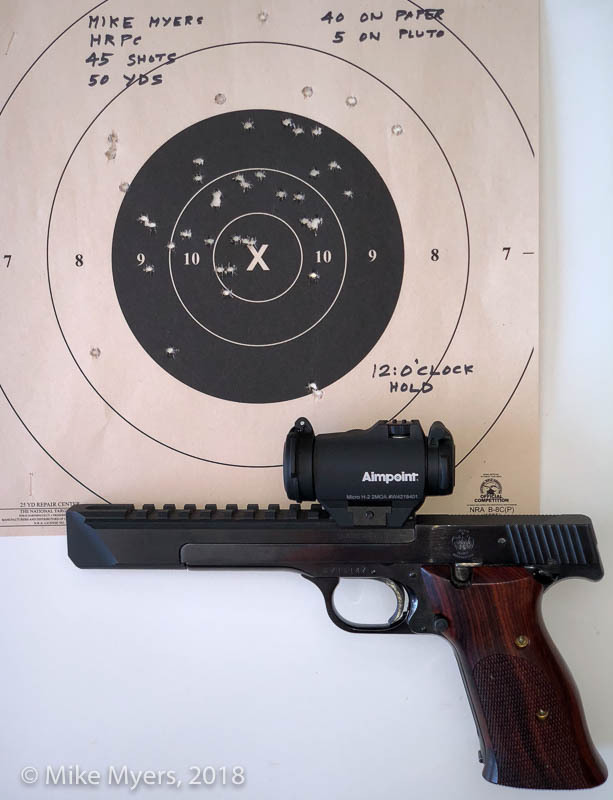 The only mods to the pistol were to install a mount on the slide for an ultradot, lightening the trigger pull to 3 3/4 pounds and cutting two coils from the mainspring. I had to keep track of the shots so we could score it. 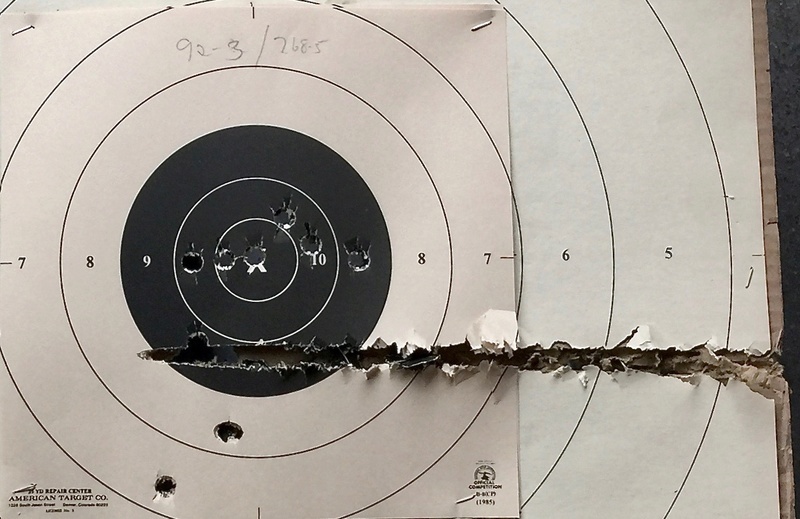 I put a second target underneath just to make sure the bottom rounds cut the ten ring except for the one nine. 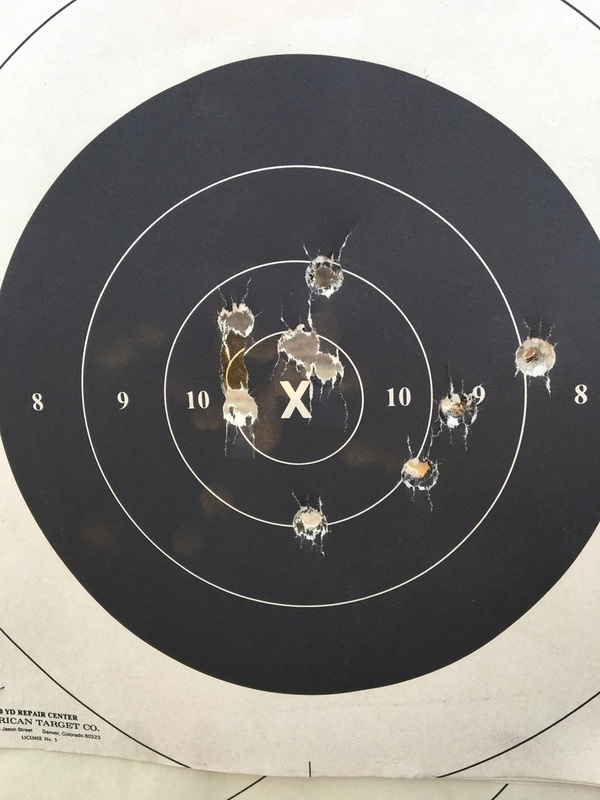 My first centerfire try at bullseye. I wanted to post this target. 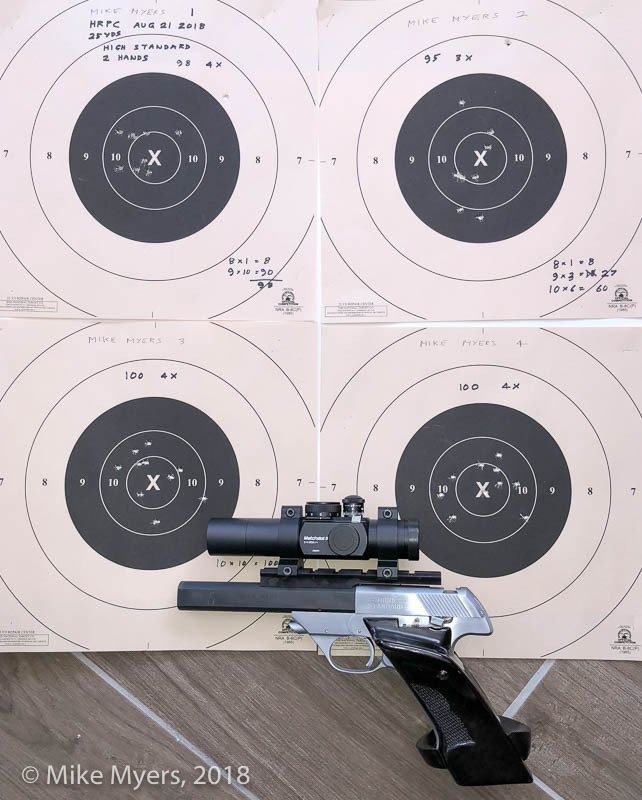 Saw some real progress last night at my weekly 22 600 match, haven't shot a match for 2 weeks, been shooting a lot of 45 lately trying to get the hang of it (and my 22 is off for work...). My prior best was a 470. Nice target. Looks like it's time to start making plans to acquire an AW93 with a nice set of Rink grips! Bullseye_Stan wrote: Nice target. Looks like it's time to start making plans to acquire an AW93 with a nice set of Rink grips! Funny you say that... despite shooting the AW93 better, I much preferred the feel, weight, and trigger on the Pardini. 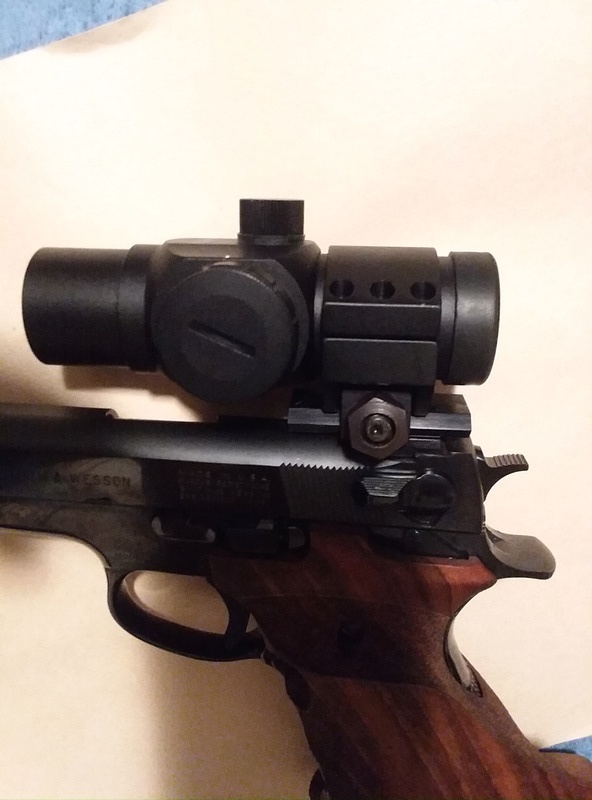 There is a discussion on Rimfire Central where I was asking about adding a barrel weight to my High Standard. Someone suggested that rather than adding more weight to my gun, I just move my Matchdot II more towards the front. Did so, and the red dot certainly did appear to be more stable. I did think that moving the sight forwards would make the gun more stable. I never imagined it would make so much of a difference. 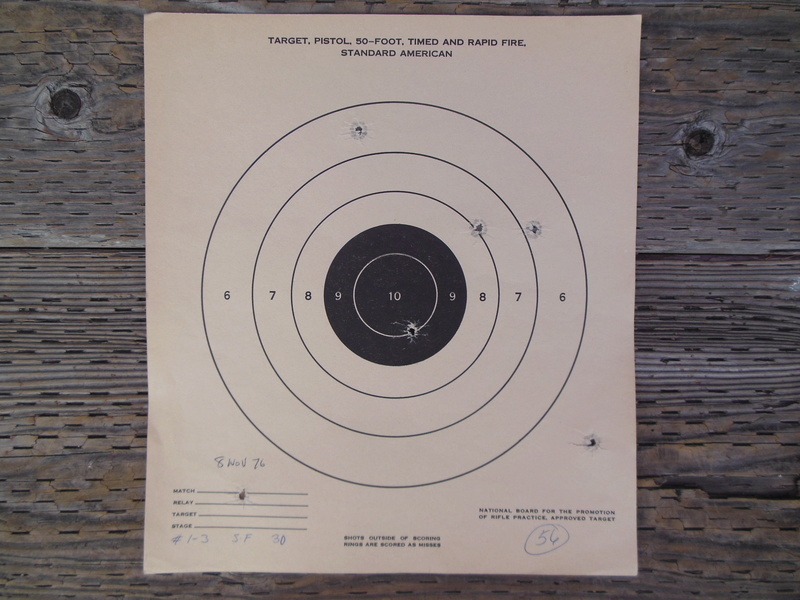 For what it's worth, the shots were NOT taken as I used to shoot, they were following Dave Salyer's advice about "area aiming". When the dot was more or less civilized, I just started applying more and more pressure to the trigger, sort of trying to delay the firing as long as I could. I think I was following all the fundamentals, and unlike other times in the past, I was totally relaxed, just enjoying myself - and surprising myself when I picked up the binoculars every 5 rounds. Oh yeah, NO blinking! Here is an interesting target. Mostly because it was with a brand new straight off the shelf 92FS. I saw where they printed with a few shots with usual sub 6 hold. Then I fired these with center hold. Stock gun, fixed sight, same day I bought it, plain USA ammo. I shot my last leg with it after Roddy worked on it some. I did something unusual this morning. 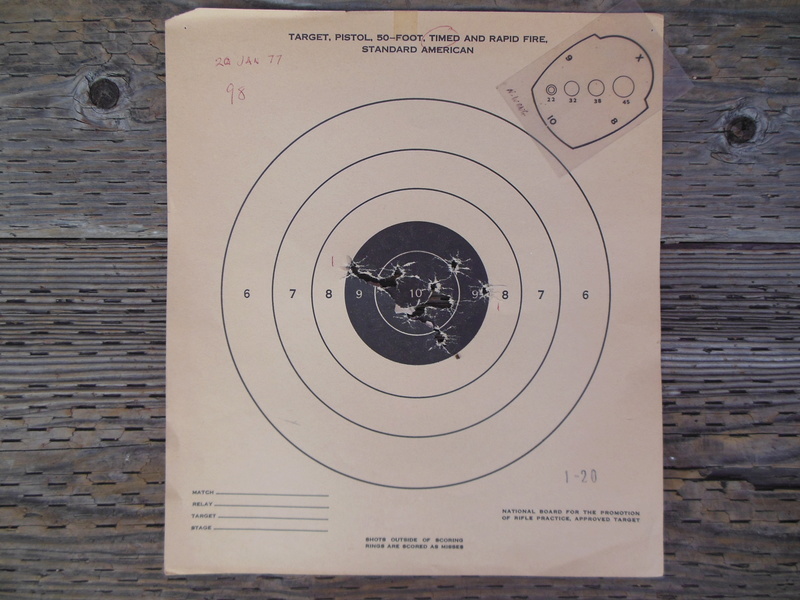 After shooting my Model 41 the way I usually do, 25 yards, I moved the target back to 50 yards and used up the 45 rounds of ammo I still had left. I think I need a smaller dot. :-) This was two-handed, obviously! Someone (LenV??) told me how many "clicks" to change the sight setting, but since I couldn't remember, I just use a "12-o'clock" hold. I guess the bullets don't fall as far as I expected. 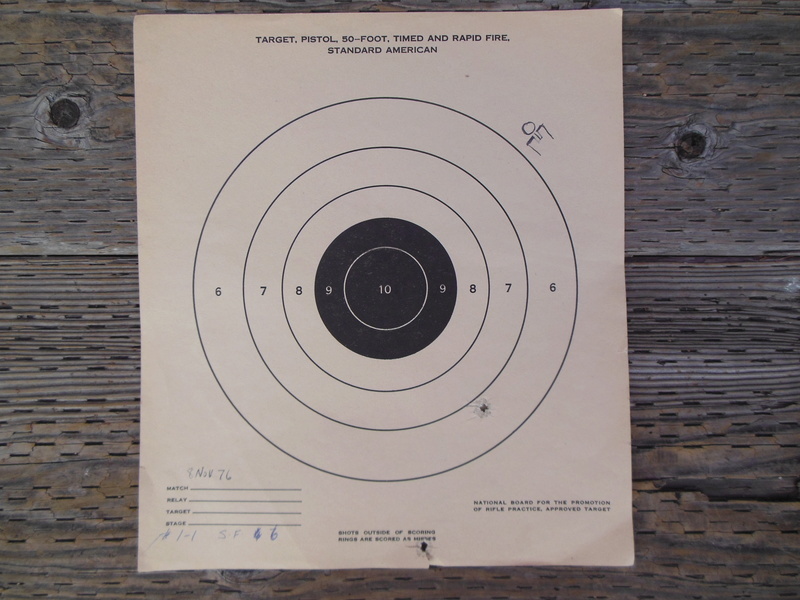 Mike, there is very little change between 25 and 50 on a .22 with a dot. Zero change on my 41 using CCISV and a dot mounted 1.5" above the bore. 2 clicks on my hot 9mm ammo, 4 on my normal .45 load and 8 on my wheel gun load. The .22 should be easy to remember. All you have to remember is nothing. Hmm, yes, I'm very good about remembering nothing! Thanks - didn't know what to expect. I would say I don't keep good targets but y'all would know I was lying. I keep pretty much everything, but only targets shot in matches get stuck to the wall. Not that they are all 100's. 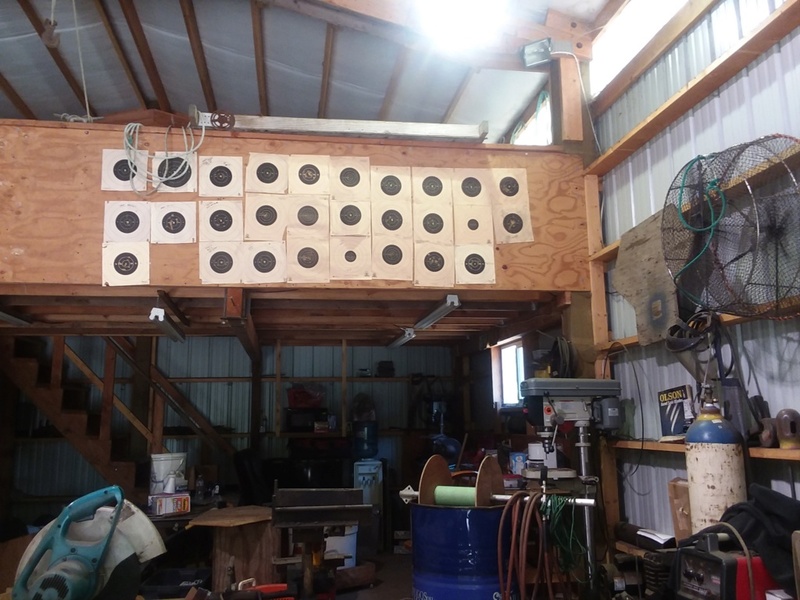 I keep 50yd targets I am pleased with. There wouldn't be any 50yd targets if they had to be perfect. The short line targets are good though.